I have to admit that I am currently running out of time for watching movies. But a friend helped me out with an impressive movie pulse of “Room” by the Irish Filmmaker Lenny Abrahamson. Brie Larson won the Oscar for her Joy “Ma” Newsome character. See by yourself: this is a awesome steady increase- I have never seen something like this before. I am so curious what kind of story caused this almost symmetrical climax? Consider sending me your movie pulse after watching this (or any other) movie, since the fun part is comparing. I am quite busy because of improving my analyzing tool set for multiple records. Spreadheet analysis with charts, graphs, normalization, gender, age, formulas and stuff. A hell of a lot of data to process. This will keep me busy probably for the next weeks. But sometimes I am able to reserve some spare time to watch a movie – like “The Nice Guys” by Shane Black which is a really entertaining piece of flick. Steady increasing heart rate – like the joy I had watching it. To guys going goon: Ryan Gosling as the stupid goon and Russell Crowe as the one with the loose fists. Watch those guys in this quite hilarious circumstances yourself. Before it’s to late. This time I’d like to start to refer to movies which are important in film history and have a certain age. “Metropolis” is the mother of science fiction – besides the Georges Méliès “Le voyage dans la lune” (1902!). Numerous experts have already debated about it’s value, impact and whatsoever outcome in vision, theme and cinematic morphology. One thing I find interesting myself is the fact that the author Thea van Harbou has had a different aim than the director Fritz Lang: I remember a statement on the extras of the restored version of Enno Patalas – Lang was mainly fond of the human-machine setting; of machines in general, whereas van Harbou focused the idealistic approach that the heart has a mediator function between hands and the mind. I showed this movie to my students and picked a random volunteer wearing the Apple Watch for running Movie Pulse for the length of the film. Again: this is a individual result and can not validate the general impact of the movie. But beside watching and exploring heart rates of movies myself, giving lectures, thinking of app improvements and features, raising comparable results of the same movie – I think it’s quite important to achieve some visual experiments on depicting the heart rate graph along with the movie itself. Without legal infringements. This approach seems very inefficient, besides the less detailed graph and the quite small images. So why not combining the result with the movie itself? Each row shows 30 minutes of the movie. 2 minutes excerpts are placed side by side, so 15 excerpts are depicting 30 minutes, 4 rows showing the almost 2 hours. 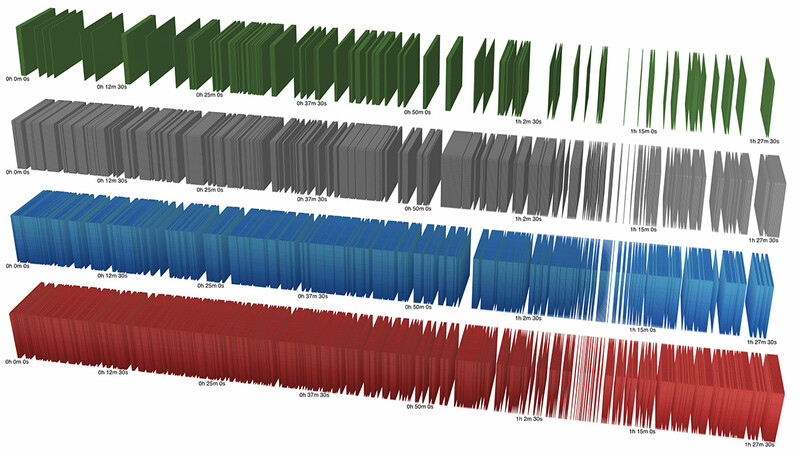 The graph below the images is just an orientation – since the green and red tint has been rendered slightly different. I determined an overall average – this refers as base zero for red and green. The max value yields 100 % red, min value provides as 100% green. To state the two most important things first: you probably will not share the empathy I have towards this movie as long as you have no children yourself. At second: I almost ruined the recording by operating my own app in a wrong way, which humiliates me of course. I will describe the problem in another post. This movie review is affected by this fact in the type of visual representation of the recorded graph. This time I can not refer to the nice average analysis which displays calm regions in green and exciting areas in red. I could rescue the raw data, at least. So this time the graph is build from scratch and the rules to identify specific regions differ. What is important to know before watching this movie: this is based on a real character and real events. Usually I prefer not to know anything of the story of the movie. But this time it is so important to know that Eddie Edwards is based on Michael Edwards who represented Great Britain at the 1988 Winter Olympics in Calgary, Canada. He was the first ski jumper for his country since the year 1929. I knew that. In fact I remember the Olympics of 1988 only because of him. He has been the incarnation of an underdog. If you don’t know much about the fact that Taron Egerton’s Eddie is based on Michael Edwards you may tent to find him overacting for the first 30 minutes or so. And this movie of course is based on a character and a real story. The writers and the director have used their fictional freedom and in order to compete with the real background, they are not subtile. Not at all. This movie’s dramaturgy is like fish wrapped in a newspaper. We are aware: the ink might be unhealthy, but fish has been wrapped like this for decades. And finally the fish is delicious. After struggling with the characterization of Eddie for 30 minutes I have been unable to defend my emotions: this movie made me cry. Despite the obvious ingredients of building a plot with a hero (aim, obstacles, turning points, mentor etc.) – combined with the backstory, I have simply been overrun. As I try to understand why, I came up with the identification I had. Probably my empathy was driven by the parents perspective: having such a encouraged and untalented child the same time. And all doubts finally being proved wrong. Exceptional graph: red marks the timespan with higher dynamic of the heart rate, green the area of less change. This is an obvious kind of movie for affecting the heart rate of the audience. It is another DC variation and it is a Zack Snyder movie. 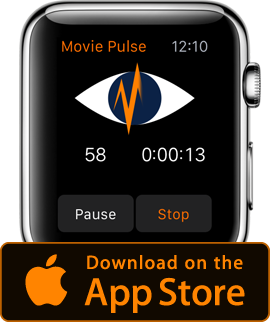 I haven’t had in mind those kind of movies at first hand while developing Movie Pulse. But hey, it is OK. Let’s have a look at this less subtile action movie. Far beyond subtile. Did I mention Zack Snyder? I don’t want to be part of the bashing, so I hesitate to discuss the ethics of superheroes and just want to state three things. First: I had have a spectacular time (2:25) in terms of spectacle and time. Honestly. Second: I really didn’t get why Batman has been ill-disposed towards Superman. I really enjoyed the first half hour of this movie: Zack Snyder played quite brilliant with giving the viewer small pieces of information. This is probably the reason my pulse has such a remarkable raise at the beginning. But by the time I recap: this might be subjective, because Kaboom! has been there as well. And did I mention Hans Zimmer? What a workaholic. The graph is obviously a remarkable steady increase with few to no times to rest. Discussing this and the peaks add up if compared to other user records. Convincing my 6 year old son to wear my Apple Watch is easy, because he and his brother love it, but it has been a challenge to get it properly mounted at his arm. The mother has not been around and he did not yet know what Gaffa-Tape stands for. My sons have seen the trailer with Flash over and over again. And finally here we are, in “Zootopia”. I had have no big expectations and seeing the trailer so many times changed my mood from “this must be funny” to “I got it”. Once more now I am so thankful not to have seen anything else of the film – letting me know the identity of Mr. Big, among so many other surprises, would have spoiled the enjoyment. We burst out laughing so many times. At the other hand both of my sons are not yet very familiar with suspense and drama. And seeing the world of movies through the eyes of a 6 year old, will definitely change your perspective on cinema. I remember proudly presenting them “An American Tail” aka “Feivel, der Mauswanderer” as a funny animated highlight. After 7 Minutes or so I had to stop the movie because I had forgotten it starts with a genocide – mouses are convicted by cats and their homes are looted and burned. My sons recording unfortunately misses the middle part and is much shorter, since we dropped the credits. So fear and getting the creeps has been part of “Zootopia” as well, in terms of my sons. The younger told me, tho older won’t tell, but silently gives consent. These reactions can clearly be identified by the large red areas and the constantly increasing heart rate at the whole length of the movie. Too bad that we had somehow a silent part in the middle – probably having the watch not that properly attached. I planned not to use this recording because of the missing middle part – until Alexander, a student of mine, has send his result of the same movie. If you look at both graphs independently, you would not identify any resemblance at first glance. The original Movie Pulse of Alexanders visit. He had watched the movie with complete credits. He started at the studio fanfare of Disney as we did, but he waited until the very end of the credits. We left at the beginning of them, what explains the different lengths. So I made an overlay and repositioned the graphs with the 1/2 hour scale units to properly match in time. The heart rates are so different concerning the trend line, but while trying to find similarities on comparing red and green areas, I discovered that some of the peaks every 1/2 hour are very close together. One is exactly at the same minute, one differs only a single minute and two are at least only two minutes apart. These two recordings bear strong resemblance – probably by chance. I am more and more motivated and curious to compare a bigger quantity of Movie Pulses of the same movie. “Zootopia” watched by a 6 year old and a young man in the twenties produced great similarities at the high and low peaks. This is a straight entry to the dream factory of Hollywood. It is a movie for those who have spend large parts of their lives in vivid celluloid narratives. For those who are deliberately following a liar who tells doubtful accounts from a fictitious world somewhere, of a scale bigger than life. Definitely for me. I delved into the story of Eddie Mannix and became part of his life as a kind of circus director, whose duty is to manage various show acts, preventing the happening of evil and to solve problems where incidents already occurred. A problem solver, a type of character cinema is full of. But Eddie’s tasks are at an extra layer, because he acts at the root of all main stream movies: he keeps a film studio running. Capitol Pictures is a fake invention of the Coen brothers, as well as all acting actors. “Hail, Caesar” is a mother of all film-in-film movies. This movie feels so fifties, it looks so perfect in it’s various versions of style – from a musical to a water ballet, a sandal movie as well as a drama (greatly exaggerated by it’s director, played by Ralph Fiennes). Not to mention the B–movieish western. I felt the tension while I was accompanying Eddie Mannix on his way through the everyday hassle. Tilda Swinton caused hilarious trouble, playing identical twins whose reputation as columnists are questionable and which are at odds with each other. And this is just one subplot – besides the major issue of hostage-taking Georg Clooney. I’ve read that this movie is tame, because nothing is at stake. But analyzing my heart rate offers the great participation I had. Look at the second half with it’s large red areas and watch out for the wavy trendline. Unfortunately I can’t tell what caused the green gap after 47 minutes. Again, this is still the weakness: not having the movie at hand to look for the scene which caused it. I was surprised seeing the end titles – this is it? Wait, Eddy, you still need to solve… no you don’t. With great simplicity and almost unnoticeable the Coen brothers have all loose ends be spun together. Although I would have loved to stay with Josh Brolin and all the others for a while. Yes, the movie is very artificial. The Coen brothers are at no point trying to blur the boundaries between the fictional story and my life. It is on screen and it stays there. But I was deliberately be part of it. According to the résumé of my seat neighbors – they where not. What did they say? Special humor? I beg your pardon, it’s the Coen brothers. Spoiler alarm. I can’t write about this movie without referring to it’s, let’s call it – events. It’s not only weapons fired in this movie – the amount of verbal ammunition is by far greater than the number of bullets. In fact the overpaid honk of director, sorry I just cite Tim Millers own film, decided to let Deadpool forget his jam-packed bag of arms in a Taxi. And I am talking about the showdown here. What happened until then? What did I see? Yes, I laughed in movie which left me clueless. Deadpools lines sound continuously like to eavesdrop at the locker room in a muscle factory. The male of course. This is tiring an funny at the same time. It comes to great moments of comedy having Deadpool acting with ordinary people which are somehow respected by him, like the taxi driver who drives him not only to the showdown – he already started to get to know Deadpool with us in the beginning, or the old blind! and black lady giving him shelter. Besides the taxi driver and the blind lady – the opening credits I liked most! Having Deadpool with it’s opponents is unfortunately cliché and predictable –Ed Skrein is completely the wrong cast for a leader of the somewhat called institution IMHO. Although Tim Miller from time to time let Deadpool dismiss the movie he’s in, but this drowns in the volley of words. Ryan Reynolds character is so over the top, already before his mutation, so I could not feel with him. But of course, this is the wrong movie looking for feelings.